Senegal Parrots are considered quiet by most people’s standards, but they definitely can let out loud and piercing screeches when excited, alarmed or upset. In general terms, however, they can make good apartment birds as noise is rarely a problem. In the wild, on the other hand, flocks of these social parrots are often heard chattering continuously, with a range of whistling and squawking calls. 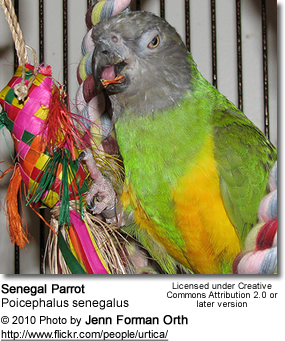 Senegal parrots do learn to mimic, but are generally more adept at sounds than clear speech. The sounds they typically pick up may be the phone ringing, whistling, microwave beeps, smoke alarms and barking. They will learn to imitate the natural calls of other birds in the house (or outside) with ease. Many learn to say a few words quite easily, but Senegal Parrots tend not to be huge talker and speak rather slowly and in a limited fashion - often with a high squeaky voice. However, some of them develop quite an extensive vocabulary and phrases. Most will develop an understanding of several common phrases like "step up". Biting, feather plucking and screaming are all common behavior problems. The best solution to preventing or eliminating these behaviors is to ensure that your Senegal Parrot has plenty of space, lots of toys and gets plenty of attention. The source of just about all behavioral problems is frustration, boredom and loneliness. These social parrots need daily stimulation both inside and outside of the cage. Any parrot that spends most of its day in a poorly furnished, small cage without anything to do and little interaction is likely to develop behavioral problems. It is critical to your Senegal Parrot’s health and happiness to make sure they’re properly socialized and trained. Bird training is the key to a happy and well adjusted bird. 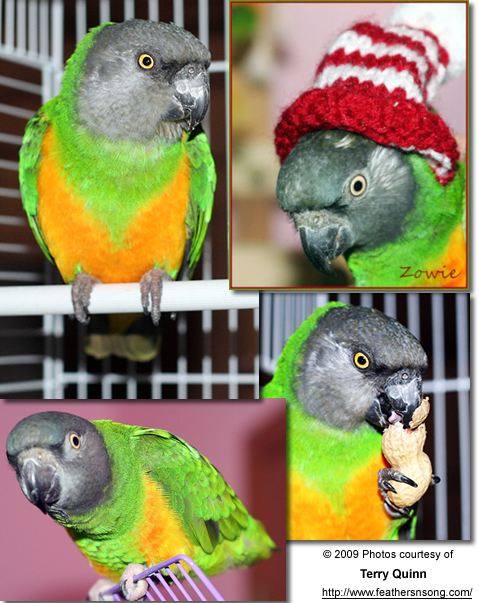 Senegal parrots are natural performers and learning a few tricks keeps them entertained. Screeching: Some Senegal Parrots may develop a habit of screeching and screaming. This is not part of their nature and when that happens, the bird owner should examine their pet's environment and make sure to remove any perceived or potential threat. For example, a dog outside their window may be upsetting the Senegal Parrot. If this behavior happens "all of a sudden" -- then anything new or changed in their environment should be examined. Jealousy / Aggression: Pet Senegals can become jealous of other family members and pets. They often develop a bond with one human and show no interest in interactions with other family members -- they may even attack them in some cases. A Senegal Parrot that bonds to one single person may not only attack other members of the household, but also their favorite person as they are prone to jealousy and displaced aggression. Despite their small size, Senegal Parrots will attack larger birds and even dogs, if they feel that they or their favorite humans are threatened. Owners should be cautious in multiple-pet homes. Senegals tend to hold a grudge against anyone who caused them fear, and they have a long memory. It is best to do everything possible not to scare a Poicephalus unnecessarily. To avoid aggression problems, it is very important to properly socialize the parrots while they are young. They should be introduced to many different people, environments and situations. Continuing to socialize the hand reared pet bird from a young age and letting many people handle and interact with it can prevent single-person bonding and allow it to become an excellent family pet. Biting: All parrots will resort to biting when they are upset, frustrated, scared or jealous. This is particularly true when they’re reaching sexual maturity. They usually pin their eyes before biting; they may puff up their feathers to make themselves look bigger when something scares them. These common signals will tell you that they are getting angry or scared. Knowing these signals will allow you to understand your pet and build a harmonious relationship. The worst things you can do when your parrot bites, or is trying to bite, is to shriek, yell and/or pull away. Such reactions will only reinforce this behavior. Instead, you should find ways to prevent being bitten. For example, instead of having your pet step up on your arm, provide a perch for stepping up on. If your bird manages to bite you, gently push your hand TOWARDS your bird. They will release your hand as they are not expecting this reaction and because this is not the reaction they were hoping for. While you’re training yourself to not react to your Senegal Parrot's aggression, maximize your time and begin training them. Tricks like “step up” are an excellent way to avoid being bitten in the first place. Additionally, take the time to learn your bird’s behavior. Hormonal Behavior: Senegal Parrots can become aggressive and sometimes phobic after reaching sexual maturity. Most major problems can be avoided by developing a strong relationship early on and using gentle training techniques. Feather Plucking: Senegal Parrots are usually not prone to feather plucking. However, if your Senegal Parrot has started to overpreen or pull out its feathers, a vet visit is indicated to rule out any medical issues. Once psychological reasons are likely the cause of plucking, you'll need to figure out what is upsetting your pet. Senegals are sensitive and a variety of situations can cause them to be under stress. Improper or cramped housing. A Senegal Parrot can feel trapped in a cage that is too small for him or her. They won’t be able to stretch their wings or exercise. These active parrots require a larger cage to allow them to move around and get sufficient exercise. Please refer to below "Housing." Boredom: Senegals are active parrots and need plenty of daily stimulation. They should be provided lots of toys and a cage with plenty of room to move around in. Foraging is one way to keep them busy. Fear and Stress: Did something change in the environment that could be perceived as threatening -- is someone new in the house that isn't behaving appropriate around your pet? A new pet in the house could also be the cause. Improper lighting. All parrots need natural sunlight or artificial full spectrum lighting to create vitamin K which they need for healthy skin and feathers. Not enough sunlight can cause feather plucking. Changes in the environment. If you have a new person or animal in the home, you moved the furniture, maybe you moved homes. Phobias: Some Senegals learn phobias later in life. It's best to prevent them by exposing them to new things from an early age and getting them used to change. An indoor cage at least 4 ft x 3 ft x 3 ft or an outdoor aviary at least 6 ft x 6 ft 3 ft wide would be suitable. If your Senegal Parrot is going to be home alone all day, it will need enough room for a variety of toys and room to swing and play between them. The more time your pet spends in the cage during the day, the larger the cage should be. Plenty out-of-cage time should be provided to socialize this parrot and allow for further opportunities to exercise and explore. Senegals love climbing and are often seen hanging upside down. To satisfy this active and clowny disposition, provide several perches and plastic chains for climbing. They also love swings, which provide a fun way to exercise for them. Like most Poicephalus, Senegals like to have a tent to hide in when they are feeling vulnerable, but when comfortable will come out to investigate what is going on. They should have at least 10 hours of darkness and quiet, to allow them to sleep and rest. Even a TV in the late night hours can be very disruptive and detrimental to their health. 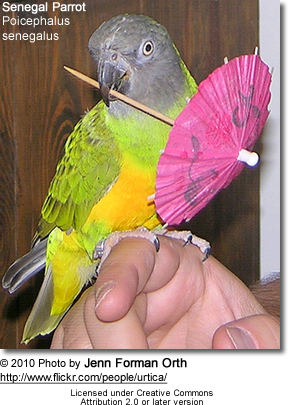 Owners should invest in a variety of toys and accessories for their birds. Senegals have playful personalities and require a lot of toys for playing, attacking and chewing so that they don’t get bored. 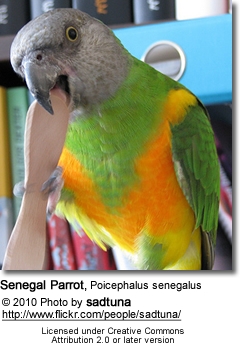 Toys: Senegals are strong chewers, so it's a good idea to provide them with some wooden perches and toys to exercise their beaks on. Multiple toys that withstand a good chew are recommended, including rawhide, leather, sisal rope, twisted cotton rope and various foot toys. Swing: Senegals are quite the little acrobats and especially love swings and ladders. 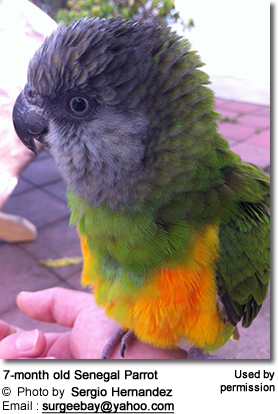 A pedicure or grooming perch is recommended to keep its nails trimmed. Long nails can be very painful when digging into an owner's arm and they can get caught in clothing and toys. Senegals should be provided with at least one hour a day to play outside of their cages on a playstand or another bird-safe area. Exercise and regular time out of the cage keeps them fit and healthy. 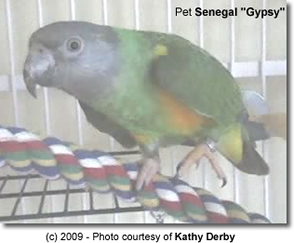 Senegal Gypsy: Kathy Derby - Gypsy's owner describes Gypsy as follows: "She is approximately 12 years old. She is extremely smart. I have always been told their vocabulary is limited but she talks up a storm. If I am not paying attention to her she will look at me and say "Hey you, will you talk to me". If I have something to eat she says to me "What do you got?" "Gypsy treat". Her other sentences are What's the matter. Get over here. C'mon. Are you ready? Hey baby. What are you doing? She laughs and makes sounds of course. There is still so much more. She misses her best friend Buddie - [a] dark gray cockatiel which she adored who passed away. She would call Buddie over to her cage. She would say "Buddie, hey Buddie, c'mere. c'mon. Buddie c'mon." And Buddie would go over and climb up her cage. Of course she would try to bite her feet or grab her tail. Since Buddie has been gone she calls for her constantly "Buddie, where's my Buddie Buddie?" It is really sad. You can tell in her voice she is upset. I did go to a rescue and adopt a beautiful cinnamon pearl but she knew the difference right away just by the color. She rejected her. I found a dark gray cockatiel and I showed her. She knew the difference but there was acceptance. Unfortunately the cockatiels face turned yellow and she rejected him. I had to rename him Buster. I have now been given a baby gray cockatiel, Buddie, which I am hoping will not change color. She is calling him/her, has tried to bite him when I showed him to her, but she is not saying Buddie in a depressed voice. So time will tell. If he changes color I don't know what I will do because she will start all over again looking for her friend." 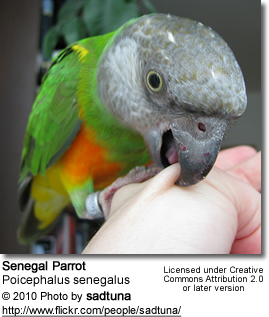 Senegals are less demanding than other parrot species, which makes them an excellent choice for someone who wants to "step up" from an easy-going and easy-care cockatiel or budgie. Consistent training from a young age is recommended to ensure potential senegal owners enjoy a bird free of destructive and annoying habits.